It's particularly poignant reading thoughts on death from someone who has just died. Martin Gardner, who introduced multiple generations to skepticism and the joys of "recreational math" through his columns for Scientific American and Skeptical Inquirer, and through the over 70 books he published on math, philosophy and skepticism, died last Saturday at the age of 95. I date my love of paradoxes and puzzles back to the afternoons I spent as a kid poring over my dad's copies of Gardner's Aha! Gotcha and Aha! Insight, two delightful collections of conundrums that seem impossible until your mind shifts in just the right way, and then: "Aha!" It's a feeling which I can only imagine is akin to what it must feel like to be a Flatlander popping for the first time into the third dimension, and which would convince even the biggest mathophobe that the phrase "recreational math" really isn't an oxymoron. But as I thought about the best way to commemorate him, I remembered that Gardner once told an interviewer that, out of all his books, the one he was most proud to have written was The Whys of a Philosophical Scrivener, a collection of his musings on life's hard questions. So, curious and wistful at the news of Gardner's death, I picked up a copy. My wistfulness deepened upon discovering that a lot of the book is devoted to Gardner's contemplation of the prospect of his death, and what might follow it. A bit of an odd man out among public skeptics, Gardner was as empirically-minded as ever when it came to debunking woo, but also a believer in a higher power and in life after death. In a comment-thread discussion about this subject on Discover Magazine's obituary for Gardner on Sunday, Gardner's old friend James Randi explained, "When I questioned him on the subject he told me that he had no really good evidence to support his belief, but that it simply made him feel better to adopt it. He said that I — and other curmudgeons — had far better evidence for our convictions, but that he just felt more secure in his acceptance." Reading Whys, it's clear that Gardner's choice to believe in immortality was undergirded by horror at the thought of a truly final death. And he confessed that he could not relate to people who felt differently. He sympathetically quoted writer Miguel de Unamuno: "I do not understand those men who tell me that the prospect of the yonder side of death has never tormented them, that the thought of their own annihilation never disquiets them." I'm one of those people. Sure, I feel a twinge of angst when I contemplate the process of dying, because I am a pathetic wuss about pain, or when I contemplate the effect that my death would have on friends and family. But to the idea of not-existing itself, I am as indifferent as Gardner was dismayed. On this point I'm with Epicurus, who famously wrote, "All good and evil consists in sensation, but death is deprivation of sensation... [Death] does not then concern either the living or the dead, since for the former it is not, and the latter are no more." But there is one point on which Gardner and I wholeheartedly agree: the utter lameness of people's attempts to redefine "immortality" into existence. You'll often hear it claimed that someone isn't "really" dead because he lives on through his work. (As Woody Allen says, and Gardner quotes approvingly: "I don't want to achieve immortality through my work. I want to achieve it through not dying.") I've also heard people argue that we're all "immortal" because our matter and energy are preserved. And then there's the notion that we're "immortal" in the sense that our existence can never be erased from the record of space-time. "It does not fortify my soul in the least to know that after I die all unmarried men will still be bachelors, that 37 will still be a prime number, that the stars will continue to shine, and that forever I will have been just what I am now. Away with these fake immortalities! They mean nothing to the heart." Whatever your philosophical outlook on how one should think about one's own death, Gardner's absence is an indisputable loss for all the rest of us. This week I'll be consoling myself by re-reading the Aha! books, and I encourage you to pick them up if you've never had the pleasure of puzzling through them. Gardner may have found the thought of literary immortality to be small consolation, but it's far more than most of us get, and no less than he deserves. This post is both poignant and fascinating to me. Mind if I blog on this? I didn't know who Martin Gardner was until recently, but I enjoyed recreational math, optical illusions, and paradoxes since I was a kid. I remember one collection of fun little math and science experiments that I liked. I just found it, dusted it off, and, yup, it's by Martin Gardner. Gardner was so much more than a recreational mathematician; his philosophical writings are quite astounding; he had an incredibly rich, thoughtful, productive life of the mind. And I think it perfectly fine (and accurate) to say he lives on in the treasury of books left behind for curious readers everywhere. No one will know my name 50 yrs. from now, but I'm sure they'll know his. That was a dead honest post Julia, thanks. I have problems with the Epicurean view. I suppose it comes down to his assertion that all good and evil consists in sensation. I think that "good and evil", or harm and flourishing as they seem more appropriate here, encompass a good deal more than sensation in the here and now. A few thinkers first: When you kill someone, do you harm them? What if you do it in such a way that they experience a consensual euphoria before drifting off into a dreamless sleep and then dying in total piece? Does it make any difference whether the person killed in such a way is a child or an elderly person? If someone is suffering from an incurable disease which causes them constant pain and makes them unable to do anything of value to themselves or others, is it more harmful to them to go on living, or to be allowed to die or even killed? There seems to be more to the value of a particular individual's life than simply that individual's sensations, even if the notion of sensation is made to include all memory, imagination, and thought, in addition to aesthetic enjoyment. I think that whatever prevents an individual from becoming the most of what they can be, from loving and doing as much as they can for what they love, and from engaging in all of the creative activity they are capable of, harms that individual. In this respect, death most certainly can be harmful to a person. As in the last case I presented, however, a person may also be harmed by the continuation of life. I think I'm somewhere between you and Mr. Gardner in my reaction to death: I have regarded with some anguish the notion that all of my experiences, my thoughts, my emotions, everything that I enjoy and all that my mind contains, will be wiped away without any recoverable trace by death, but my anguish at all of the waste and loss this entails is mitigated by my understanding that so much productive, creative, and loving activity can grow out of it in the meantime, and will continue to grow beyond me in both time and space, in ways that I am aware of and ways that I will never know. There are many reasons to be thankful for life, and contemplating our own mortality is one of the things that can show this to us. Excellent post Prof. I discovered Gardner a total of 2 days back thanks to Michael Shermer's eSkeptic newsletter. I dont know whether to be happy on discovering him or lament his loss. I will go with the former. What struck me was his belief in fideism - my take away is that faith and reason are independent and someone completely rational can have faith and someone completely devoid of reason can also have faith. Once again - excellent eulogy. Oops i did not realise that this post is by Julia - sorry. Thanks for your post Julia. 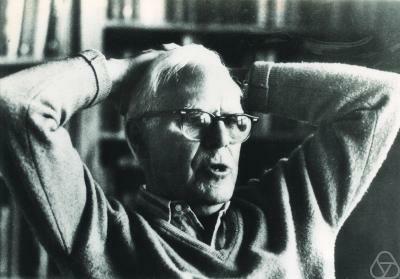 Martin Gardner was one of the greats and he deserves to be remembered. It seems to me I have always known his work, well at least since my undergraduate years in the late seventies. Since that time, although I never had the chance to meet him, he has been something of lifelong companion: first through his math columns in Scientific American, then in his other books and skeptical writings. I remembered getting his "Fads and Fallacies in the Name of Science", a very long time ago. At the time, it was exactly the kind of book I needed to make up my mind about all these paranormal claims everybody was talking about. He wrote on an astonishing number of topics, always clearly and knowledgeably. I have read the "Whys" Julia mentions: it is indeed a very interesting book. His argument for faith may be the best I have seen: he says that he does not have a case but freely decides to believe anyway. I can respect that. A strange thing, however: he doesn't seem to be well known outside the skeptical and mathematical circles. This is a shame. von Neumann, who knew how to live so fully, did not know how to die. Freud believed that the eqo cannot logically conceive of the end of its own existence, which helps explain why so many patients don't follow their doctor's advice about cigarette smoking, seatbelts., etc. The Greeks had a less-threatening picture of the afterlife: Since there was no original sin, there was only Hades, which was definitely not Hell.No one seemed particularly unhappy when Orpheus went down to get Persephone. This is probably why Greek women were not slaves: there were Greek female Gods, and there were captive Barbarians. I think the true philosopher would die as did Socrates (and be sure to read I.F. Stone's "The Death of Socrates".